I’m not a huge fan of oysters, but when half of Twitter recommended that I try the Oyster Stew at Sweet Grass, I had to listen. Thank you, internet, for making an excellent suggestion. My bowl of oyster stew was excellent – it was handful of shucked oysters in a creamy broth with bacon and potatoes. Sweet Grass is the latest restaurant to open in Cooper Young. The menu of low-country food (think jambalaya, shrimp and grits, and seafood) is divided into three sections of small, medium and large plates. The small plates are mostly salads, soups and appetizers, while the medium and large plates are more typical entrees. I made a meal of the fresh greens with honey balsamic dressing (which came with two hush puppy-style balls of fried goat cheese) and the oyster stew. My partner in crime had the jambalaya. It was lighter than traditional jambalaya, but the chicken, sausage, corn, okra and tomatoes were all incredibly fresh. But the part of the menu not to miss is the “sweet plates”. When Sophorn tried Sweet Grass a few weeks ago, she wrote a glowing review of the deep-dish sour cream apple pie. It’s a good thing I ordered a to-go slice, because some of the exclamations I made after the first bite weren’t exactly family friendly. Sour Cream Apple Pie from Sweet Grass, Memphis, Tenn.
It’s the best pie ever. Seriously. 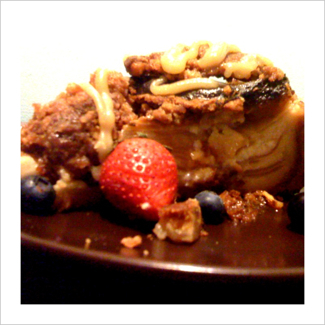 Layers of thinly sliced apples and sour cream filling are stuffed between a crust and some delicious pecan crumbles. The whole thing is drizzled with caramel sauce. For those of you who like to get dessert to go, I can vouch for this pie’s tastiness at any temperature. 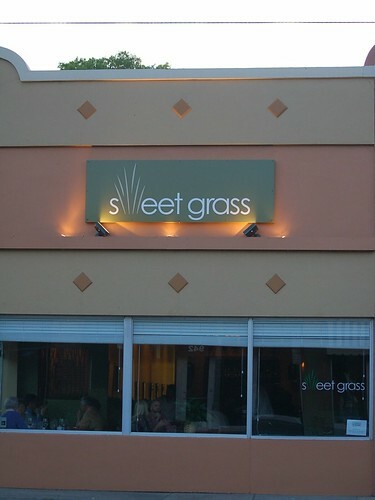 Right now, Sweet Grass is only open for dinner Tuesday – Saturday. They’re planning to add lunch sometime soon. Reservations are not required, but they can be made. Hey thanks for the link back. Your pie photo looks more delicious than mine. Oh and yes the pie was very good cold too. You are the 4th or 5th person recently to give this place high praise, I’m psyched to go soon. ditto on the pie. i like, about died from delicious when i tried it.